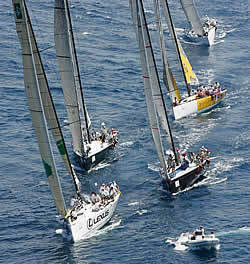 This year will see the Circuit 21 boats from 11 different nations. Last year the racing was close, with races won and lost by seconds. This season promises to be even more exciting, setting new standards in every area. The Breitling Med Cup is attracting the best sailors in the world. From the round the world racers, massive budget America�s Cup sailors, to medalists in the Olympics, all come together to compete on the TP52 Breitling MedCup Circuit. The penultimate event in the circuit will be run by the Hellenic Offshore Racing Club in the ancient military port of the Micromilano peninsula in Piraeus. Athens has long had a strong relationship with the sea and this tradition has continued from antiquity through to the modern day, when this historic capital played host to the 2004 Olympic Games. Without doubt one of the most spectacular venues in the Circuit, as much for its history as for its island-filled clear waters. Welcome to the cradle of the Mediterranean!